Painting My Mind’s Eye – Abstract Color Fun! Posted on March 23, 2017 April 7, 2018 Posted in AbstractsTagged acrylic paints, masking tape4 Comments on Painting My Mind’s Eye – Abstract Color Fun! I call this art journal spread “My Minds Eye.” It has one central element that resembles both an eye and a compass. Isn’t that how things are for visual people: seeing interesting things evokes all kinds of thoughts and lead to all sorts of paths? Like this morning when I had to stop on a walk to admire fragile ice on water puddles. When I was standing there, I wished that nobody sees my weirdness. I was staring at the ground, holding a phone to get photos, with two beagles that were very impatient, eager to move forward. Maybe the beginning of the spring made me paint with hot tones, and the ice most probably inspired me to include a similar translucent element in the painting. I created the spread by following the 7-step method that I developed for the class Planet Color. I have repeated this process many times because it’s a fun and worry-free way to paint unique abstracts. For example, see the blog posts What’s in a Good Composition?, Using Color Schemes for Home Decor, and How to Transform Ideas into Paintings. I know I am not the only one who worries about the composition while painting and the 7-step method makes everything fall into place effortlessly. Masking tape was used to frame the piece. 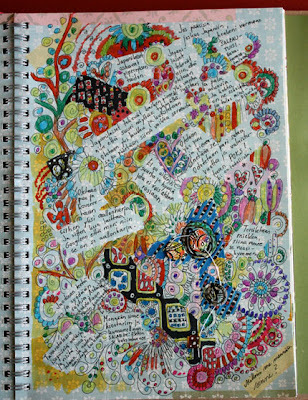 I haven’t done that a lot in my journals, but I like the result. My husband made me a new easel from an upright support of a shelving unit. It’s so handy and adjustable that I have started to use it a lot. 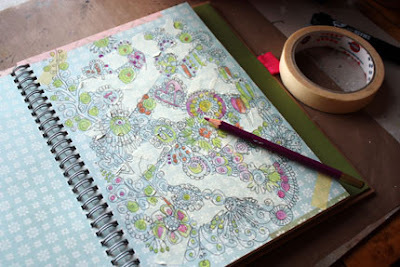 I can use it even for art journal pages, not only for canvas art. Planet Color – Sign up Now! I ran Planet Color for the first time last fall, but it’s coming back now! 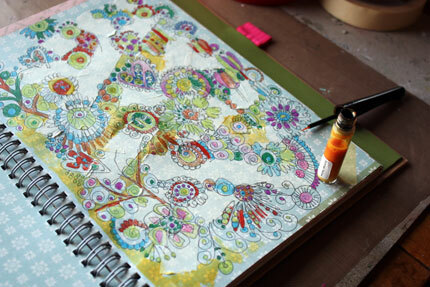 Whether you want to paint art journal pages, thick paper or canvases, this is a fun online workshop. It’s suitable for beginner painters and all who struggle with color compositions. >> Sign up here! Last week I visited a fascinating exhibition. The gallery displayed Yoshinobu Nakamura’s wood intarsia art. Yoshinobu Nakamura is a Japanese artist living in Finland. He creates masterpieces by combining tiny wooden pieces. I was deeply impressed how the characteristics of various tree species and specimens showed in his work. I wanted to try the subtle color scheme and some kind of intarsia myself. And I did, only using watercolors and watercolor paper instead of natural wooden blocks! Speaking of tiny pieces of paper, I have always loved them. When I was a teenager, I cut the pieces from magazines and made a mosaic type of work. Some of them never got finished as they were painfully slow to create! Years later, I made a pen holder for my husband using paper scraps cut from magazines. I carefully covered every surface that could be reached and finished the penholder with gel medium. It has survived at least ten years! But this intarsia project was going to be different from mosaic work. 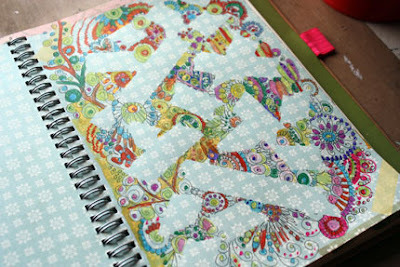 I would not only cut the paper into small pieces but also adjust each piece in line with others! I started the project by painting the papers. For some of the painted areas, I also added lines resembling wood grains with a black drawing pen. Next, I tried cutting the pieces. I discovered that they have to be put on top of each other, right side up. The cut line will then fit perfectly. I used masking tape to attach the cut pieces together. The big piece that I made looked pretty interesting. But it looked even better when the geometric shapes were cut out of it! I painted one watercolor paper to look like pine wood. The spotty paper was found from the stash. After hours of cutting and adjusting, the artwork was finally finished. See, all the papers are on the same level, not on top of each other! With intarsia technique, you can use thick papers for collage art! My belief in watercolors continues to stay strong. I love how easy it was to imitate wood with them! Once the artwork was put together, I attached the piece, with masking tape background and all, onto a white watercolor paper using gel medium. I think I call it “Rolling Stones.” Have fun with this technique! I made a page about Japan and wrote how I love all the tiny stuff they produce from bonsai trees to small boxes. Instead of layering with paint I used masking tape. Here are some snapshots from the process. Here you can see the masking tapes and how I have doodled over them. I started with black marker and color pencils. Then I added some glitter paint. Now I have removed the tape. Here’s the final page again. 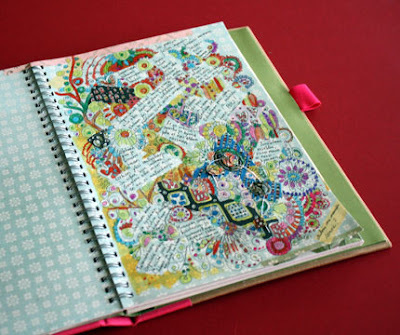 I have filled some of the areas with handdrawn patterns but used most for journaling. Will definitely used this technique again!